The Division of Water Resources (DWR) has adopted a river basin approach for the long-range planning that is necessary to guide the use of North Carolina's water resources in a sustainable manner. Put simply, this means that for planning purposes DWR will evaluate the current and projected uses of surface waters against the amount of water available in each of the 17 major river basins in North Carolina. The analysis of this information, and whether there is enough water to meet instream needs and support existing and projected offstream uses, will be presented in individual plans specifically prepared for each of the major river basins. A critical component of this planning effort is the determination of how much flow is needed to support and sustain the aquatic life present in specific watercourses. The amount of water needed to sustain the diversity of aquatic life and the functioning ecosystem in a river or stream is referred to as the "ecological flow." The challenge facing DWR is how to determine the appropriate ecological flows for the variety of waters in North Carolina, so these values can be included in our comprehensive river basin planning efforts. DWR presented a Water Allocation Research Seminar on this topic on June 29, 2010. Click here to view this slide show. The Division of Water Resources' (DWR) overall planning efforts rely heavily on river basin hydrologic models that are prepared within or for DWR. These models, when completed, will allow evaluation of water availability at any specified location. Scenarios that would be routinely analyzed include stream flows as influenced by water withdrawals and wastewater discharges under existing conditions. DWR will also analyze withdrawals needed to meet the projected demands for the 20- and 50-year time horizons. To simulate declining stream flow conditions in the event of increasing atmospheric temperatures and accelerated evaporation, one or more additional scenarios will be analyzed that simulate climate change for the 50-year time horizon. Each river basin model will also include a set of hydrologic data for the unaltered flow condition with no reservoirs, withdrawals or discharges. During river basin modeling discussions, it became clear that a key piece of the overall approach is how to quantify the amount of flow needed at a specified location to maintain the ecological integrity of the water body - or the "ecological flow." Ecological Integrity is "the ability to support and maintain a balanced, integrated, adaptive community of organisms having a species composition, diversity, and functional organization comparable to that of the natural habitat." A living system exhibits ecological integrity if it recovers from a disruption and continues to provide the natural goods and services that normally accrue from that system. Flow regime encompasses the following characteristics of stream flow and their interactions: magnitude, timing, frequency, duration and rate of change. A flow regime that protects ecological integrity is often referred to as an ecological flow or instream flow, although the latter term is sometimes used in a more general sense to refer to the amount of water flowing in a stream - without providing any particular level of protection. Karr, J.R. and D.R. Dudley. (1981). Ecological Perspectives on Water Quality Goals. Environ. Manage. 5: 55-68. Earlier efforts to maintain instream flows focused on minimum flows or minimum releases from dams. This approach can work as long as the withdrawals of water from a stream are relatively small in the context of the naturally occurring flows in that stream. However, withdrawals often increase over time as various demands for offstream water use expand, including public drinking water supplies, industrial uses, irrigation and use in power generation. This is especially true in areas experiencing significant population growth and land development. If withdrawals are increasing and the only protection for instream flows is the specified minimum value, more and more of the stream flow present on a given day is withdrawn (or stored in a reservoir) for offstream use. This results in increasingly frequent and longer periods when the only flow remaining in the stream is the specified minimum value. There are two negative aspects to such a trend. First, minimum flows are intended to be only occasional short-term events that maintain stream conditions at a survivable level for aquatic life. One example of such a minimum flow requirement is the "7Q10 flow" - the lowest flow occurring for seven consecutive days, with a probability of occurring once every 10 years. This is a drought flow statistic that is used to determine wastewater discharge effluent limits such that the pollutant load can still be assimilated and chemical water quality standards can still be maintained during the driest week occurring once every 10 years. This type of minimum flow will not protect ecological integrity if it is frequently the only flow in the stream, and/or occurs for long periods of time. The potential for global climate change to change the patterns of water availability adds to the importance of protecting ecological flows, not just maintaining minimum flows of increasing duration. Second, a minimum flow approach does not incorporate critical characteristics of a flow regime (magnitude, timing, frequency, duration, variability and rate of change) needed to protect ecological integrity. Stream biota have life cycles that are adapted to a flow regime, not a constant minimum flow (Poff and Allan 1995). Minimum flows lack the variability between different times of year (monthly and seasonal), as well as the inter-annual variability between different types of years (wet, dry, average). When this variability is reduced or lost, aquatic species diversity is often diminished (3.56 mb). Species that are most tolerant of degraded ecosystems can predominate - analogous to the way that weeds and invasive exotic species can colonize cleared land. At this point in the process for North Carolina, the state Division of Water Resources is focused on identifying the best technical approach to determine ecological flows throughout the state. Any eventual application would undergo a policy review that would consider a whole range of issues - a process that would involve the affected stakeholders. Much can be learned from investigations conducted in other states. The Southeastern Instream Flow Network (SIFN) and Instream Flow Council (IFC) have also compiled a great deal of useful information. At present, the only statute that directly regulates withdrawals in North Carolina is the Water Use Act of 1967 - and this only applies to designated Capacity Use Areas. The N.C. Division of Water Resources (DWR), however, may include conditions regulating withdrawals and instream flows when reviewing various other permits that might be required. These permits include sections 401 and 404 of the Clean Water Act, the N.C. Dam Safety Act, federal hydropower licensing, and reviews and environmental studies required by the National and N.C. (State) Environmental Policy Acts (NEPA and SEPA). DWR's instream flow program approach is project-specific and may involve in-depth field studies and aquatic habitat modeling to determine instream flow recommendations. DWR's comprehensive river basin planning program, however, requires an approach that can be applied throughout the state for planning purposes. Ecological flow values are needed at every location of interest in river basin hydrologic models to assess water availability for both instream and offstream needs - now and in the future. The current challenge is to develop an approach that can determine ecological flow values for a multitude of locations in a relatively short time. Such an approach also needs to reflect the flow regime characteristics needed to maintain ecological integrity, and recognize the diversity of stream types and ecosystems in North Carolina. A one-size-fits-all minimum flow standard for the entire state would not accomplish this objective. It should be noted that any new approach is not intended to replace in-depth, site-specific studies for particular water project proposals - especially those larger projects with more complex environmental concerns. A first step often used in determining ecological flows is to develop a classification system for streams that subdivides surface waters into a manageable number of distinct groups. The approach for quantifying ecological flows can then be tailored to the hydrologic and ecological characteristics that define each group. A good example of statewide stream classification is the system developed in New Jersey. In the summer of 2009, staff from DWR, the Wildlife Resources Commission (WRC) and the Environmental Defense Fund (EDF) began discussing what technical work was needed to develop a technical approach for determining ecological flows in North Carolina. Funding from EDF was used to contract with Environmental Flow Specialists to develop a hydrologic stream classification system specifically for North Carolina. DWR, WRC and EDF jointly reviewed the progress of this work. The consultant's work was completed in December 2009 and culminated in a two-day workshop for professionals selected for their expertise in various aspects of stream ecology. The workshop first introduced the hydrologic stream classification system developed for North Carolina - the technical analysis behind the classification system and how to use the software. The consultant also performed an additional analysis comparing USGS stream gage data and flows simulated by the OASIS model for the Neuse basin. The hydrologic classification software for North Carolina is a proprietary product. Non-profit organizations and governmental agencies can purchase the software by contacting Environmental Flow Specialists. The different classifications show some geographic orientation to differing geologic regions across the state, but geographic location and geology were not factors in the consultant's analysis. Rather, geology affects stream flows that drive the classification system. Click here for a map of the 231 gaging stations and their stream classification. The left side of the screen will display a menu box labeled "Places." In this, scroll down and click on "Stream Classes" to display a checked box for each of the original seven classifications. These boxes can be checked or unchecked to display one or more types of stream at a time. D. Small Flashy Streams - subdivide into natural and "accidental"
G. Small Seasonal Streams - subdivide into natural and "accidental"
Classifications D and G can reflect hydrologic characteristics influenced by particular underlying geology - most notably the Carolina slate belt formation. However, these two classifications can also reflect hydrology affected by land use, impervious surfaces, numerous small impoundments and other alterations. This latter case would fall into the "accidental" category of the subdivision of these two classifications. Ultimately, DWR intends to develop a specific technical approach for determining ecological flows for each of the 11 different stream classifications. For streams and locations where U.S. Geological Survey (USGS) stream flow data is lacking, river basin hydrologic models will be used to simulate a record of daily stream flows that can then be analyzed with the stream classification software to determine the hydrologic classification. The first step was to identify a suitable test site for a demonstration and evaluation of alternative approaches for determining ecological flows. The site needed to have either USGS stream gauge data or a completed river basin hydrologic model. The other criterion for selecting a demonstration site was the availability of a model of physical instream habitat conditions as a function of stream flow. With this in mind, two sites on the Eno River between Hillsborough and Durham were selected. 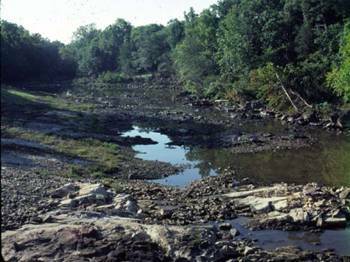 The Neuse River Basin hydrologic model is ready for use and high-quality habitat modeling studies already exist for the Eno River at Hillsborough and the Eno River State Park on the west side of Durham. 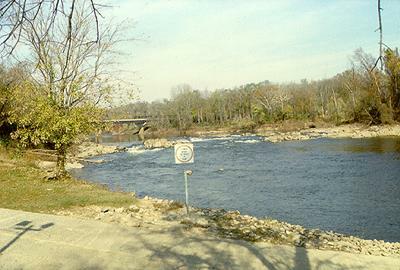 The Eno River is also a voluntary capacity use area. 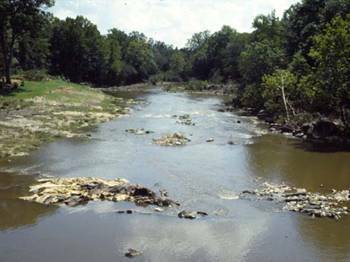 Click here for a map of all aquatic habitat studies DWR has performed in the Neuse River Basin. The two Eno River demonstration sites being evaluated are numbers 3 and 5 on this map. Clicking on any of the sites will open additional information about that site. Setting the threshold for allowable withdrawals as the amount that results in a change in the hydrologic stream classification. Allowing withdrawals at a certain percentage of the ambient flow adjusted on a daily to weekly basis. The Community Water Supply Plan for the City of Charlottesville, VA contains an example of this approach. A description of the ecological flow component of the plan, as well as other case studies, can be viewed by clicking here. Setting a flow target that varies seasonally or monthly, and allowing some variation within bounds above and below this target. Other approaches suggested by the analysis. The Neuse River Basin model will be used to generate daily flows for 80 years of record at the two Eno River demonstration sites. By trying different flow targets and percentages, DWR will be able to test the effects on aquatic habitat at these two locations.